DENIS DE YOUNG was the lead singer of famed American pomp rock act STYX for as long as 1961-1999 (almost the entire time). From 2001 it was settled in court that he was permitted to use the name STYX in descriptive phrases to promote his solo career, hence the title here. 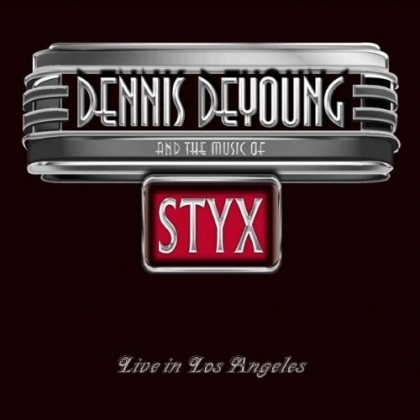 Denis who turns 68 next week has in addition to his heyday with STYX (all in all 13 studio albums plus live and compilation outings) released six solo albums, performed in various golden oldies shows, made movie scores and musicals, and now this retrospective CD/DVD/Bluray recorded originally for TVon March 18 at the El Rey Theatre in Los Angeles California. First up I must say that many vocalists lose their singing abilities far before calling it a day while this, at the time, 67 year young (pun slightly intended) guy is almost in his prime. Opening with “Grand Illusion”, a suitable opener about attending a show, via their breakthrough hit “Lady”, and pretty much only leaving out their only number one hit “Babe” on this musical journey. Most of the songs are from their seventies albums, but he also includes his own modest solo hit “Desert Moon”. The band feels tight and is actually a seven piece with his wife Suzanne on backing vocals. The setting seems ultimate and the audience appreciative. The song material is quite strong but a bit too seventies for me at times. My absolute favourite must be the quite RAINBOW-ish “Blue Collar Man”. But apart from that I find it hard to reminisce a better entertainment at the age of almost 70. A worthy testimonial to the music he was himself highly instrumental in creating.